We offer a chic and stylish collection of women's wallets and clutch purses in wonderful designer inspired prints and patterns. Choose from a wide variety of popular women's wallet designs including flat frame, cross hide and rhinestone buckle models that look great with traditional Western outfits and contemporary urban wear. Browse our collection of women's wallets and chic clutch purses in durable patent sheen leatherette, zebra print leatherette, soft leatherette and other high quality micro fibers for a well crafted fashion accessory. Our wallets feature multiple interior pockets and convenient slots for photo ID's, licenses, credit cards and pictures. Select from a terrific selection of faux-reptile, giraffe leatherette and croc-replica patterns and prints in exquisite colors including turquoise, floral pink and lime green. 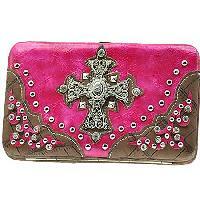 In addition to solid color wallets we also carry a select line of clutch purses and ladies wallets that are adorned with popular designs including chopper crosses, skulls and roses, rhinestone peace signs, embroidered initials and many other traditional and pop icon symbols. All our women's and ladies wallets measure 7.5" in length, 4" high and 1" deep for a lightweight and convenient accessory that fits easily in large coat pockets, handbags, purses and backpacks. We all know handbags are the "it" item for fashionable women but what goes in those stylish purses? fashionable wallets, of course. While the trend is not to carry as much as cash as even 5 years ago women still want practical and fashionable flat frame wallets to hold credit cards (to buy more handbags), pictures of their children and cards with important information. At Best Handbag Wholesale we offer retailers a fantastic collection of wholesale wallets that feature eye-catching colors, handy inside slots of licenses, pictures and credit cards and fancy ornamental décor. From stylish western wallets to more upscale cosmopolitan chic flat frame wallets, Best Handbag Wholesale is your source for the finest in women's wallets. A popular style of wallet is the flat frame wallet. Convenient, easy to hold and store, this model is great for fashionable women. In our expanding online showroom you'll find a chic and stylish collection of wholesale flat frame wallets in many colors and designs. From zebra stripe with catchy pink, green and red backgrounds to camouflage with tassels and rhinestone studded wallets with black backs, we offer women the option to go traditional or contemporary with their billfolds. You'll also find a terrific variety of cross wallets that feature a thick wallet with top frame closure, inside drivers license/picture slots and a back magnetic flap pocket. Made from sturdy leatherette materials and featuring a stylish front cross design, these wallets will be a hit in your retail shop. One problem many women have with fashion is the price. Genuine Gucci handbags aren't cheap and when you are piecing together items for a full outfit you need to keep the cost in mind. At Best Handbag Wholesale we help solve this problem by offering retailers wholesale designer inspired wallets that look just like the real thing for only a fraction of the cost. Now stylish women can accessorize their favorite western handbags with high quality wallets that compliment traditional and contemporary outfits.